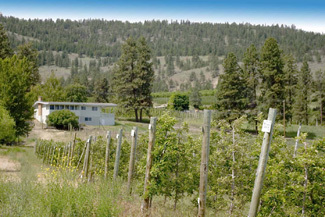 High density apple orchard (Royal Gala and Ambrosia) fully fenced and irrigated with 2 homes on 5.70 acres. Excellent view over the orchards to Giants Head Mountain and Okanagan Lake. (See video) The main home is level entry with a walkout basement. It is 2 bedrooms, 1 bathroom up and 2 bedrooms, 1 bathroom down. The living room and kitchen open onto a large covered deck that captures the views. The smaller second home is 2 bedrooms and 1 bathroom with a partially finished basement. It is rented for $750/month plus utilities (month-to-month tenancy agreement).